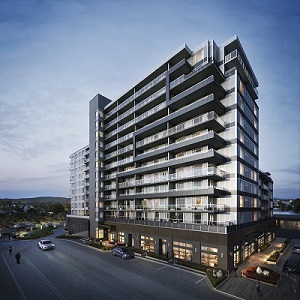 Calgary-based Boardwalk Real Estate Investment Trust (BEI-UN-T) has partnered with RioCan Real Estate Investment Trust (REI-UN-T) to build a 162-unit multi-residential rental tower in the Brentwood Village shopping centre in Calgary. The mixed-use development joint venture, named Brio, will include a stepped six-, 10- and 12-storey high-rise with about 130,000 square feet of rental housing to be managed by Boardwalk and 10,000 square feet of retail to be managed by RioCan. The estimated total cost of construction is $75 million to $80 million, shared equally by the two REITs, and the project is anticipated to be completed in 2020. Sam Kolias, chairman and chief executive officer of Boardwalk REIT, said the site is located in a very desirable location adjacent to the city’s light rail transit line and close to the University of Calgary, Foothills Hospital and McMahon Stadium. “It’s a very exciting development in an amazing community,” said Kolias. “We worked really hard with the existing community and have been very sensitive to the needs of the existing Brentwood community, where we’ve all together come up with larger unit sizes providing a bigger choice to a bigger population group in Brentwood. Back in 2017, RioCan announced its plan to turn dozens of its retail properties into mixed-use developments, then created the RioCan Living brand in early 2018 to carry out that ongoing strategy. As of June 30, Boardwalk had 32,761 rental units across Canada – 12,559 in Edmonton, 5,657 in Calgary, 939 in Red Deer, Alta., 645 in Grand Prairie, Alta., 352 in Fort McMurray, Alta., 6,000 in Quebec (Montreal and Quebec City), 4,024 in Saskatchewan (Regina and Saskatoon) and 2,585 in Ontario (London and Kitchener). “We’ve developed and are developing just over 1,000 units now over the last few years and we’ve got opportunities in our existing lands in the west and the east to build another 6,000 units,” said Kolias. “We’re really excited about that. This is all about our long-term strategy to reduce the average age of our community and to build new communities to lower our average age. Kolias founded the trust’s predecessor, Boardwalk Equities Inc. (now called BPCL Holdings Inc.), with his brother Van Kolias in 1984. He is also the president and co-founder of Boardwalk Properties Co. Ltd.
Sam Kolias had obtained a Bachelor of Science in Civil Engineering in 1983 from the University of Calgary, and a designation as a Certified Property Manager from the Real Estate Institute of Canada in 1995. He has been a fellow of the Real Estate Institute of Canada since 1985. Last year was a transitional year for the REIT as more than 3,000 suites were upgraded. The company plans to continue renovating 1,000 to 2,000 suites per year. – and average monthly rent of $1,076, up from $1,048 in December 2017. “The positive revenue trend that began approximately nine months ago from improved occupancy and higher rents as a result of our front-loaded investment in suite and common area renovations continue to have a positive compounding effect and has resulted in significant growth this quarter,” Kolias said in a statement when the results were released. Kolias told RENX the company’s key focus right now is changing “our culture to grasp change and actually use change and find new ways always to become better. “That’s one of the biggest things we’re working on is changing our culture to a culture of change,” he said. In its recent financial results, Boardwalk said its long-term strategic goal is to have a portfolio split approximately 50 per cent in the high growth markets of Alberta and Saskatchewan and 50 per cent in other high growth and undersupplied markets including, but not limited to, the Greater Toronto Area, Vancouver, Ottawa, Montreal, Quebec City, Winnipeg, and Halifax. “To accomplish this, the trust intends to strategically partner, acquire and/or develop 10,000 to 15,000 apartment units in high growth, undersupplied markets, while also divesting some of its current non-core assets. “The trust’s portfolio growth will primarily focus on opportunistic value creation opportunities in major markets over the next 10 to 15 years,” it said.